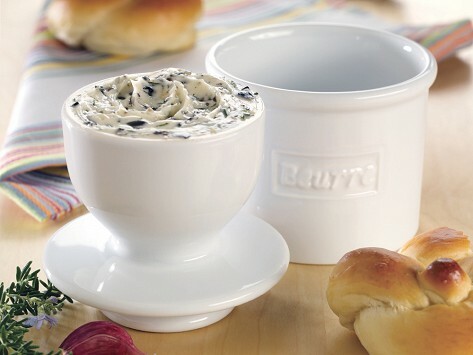 This updated take on a French butter crock stores butter out of the fridge and keeps it perfectly spreadable and fresh. It combines storage and serving and is beautifully made in new bone china to look great on the table or countertop. Add water to the crock to create a seal that blocks air from spoiling butter (both store-bought and homemade) and keeps it fresh for up to three weeks. Dimensions: 3.78" diameter x 4.25"
Love it! Got one for myself and my daughter. No more rock hard butter from the fridge. My husband, in particular, really loves it - he gets to smash the butter into the cup, and he's an avid toast eater...so this is his go-to! Very nice to have soft butter in a convenient protected container. This tried-and-true method has been around since the 19th century and is still a great way to keep butter tasting delicious and perfectly spreadable.